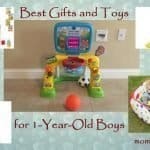 Buying a toddler basketball hoop for your child means fun and games plus developing skills! My kids love playing with our hoop in our backyard. When they have friends over, they play with it even more. We purchased it when my son was two-years old. Now he and his little sister like playing with it together. It’s fun to have a toddler basketball hoop that adjusts for their ages and has lasted this long. Basketball can be a great way for toddlers to improve dexterity and hand-eye coordination. It can also help them learn social skills when they play with others. Playing basketball is a great activity for kids to have fun while learning physical and social skills. There are plenty of toddler basketball hoops available for your kids to start playing and having fun! Below, we’ve reviewed 10 products, giving you the clear pros and cons so you can find one that fits what you’re looking for, within the budget that you have. 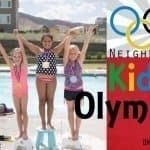 Get your kids running around and playing, whether it’s indoors or outdoors, with one of these options down below! While shopping, we suggest considering these three things: longevity, safety, and fun. When buying a toddler basketball hoop, take into consideration both how well it’s made and whether it will be a toy your child can use for very many years. Kids grow quickly. You may want to buy one that adjusts so your kids can play with it for years, or purchase a cheaper, small one then plan on buying another one when they outgrow that. When buying products for your kids, your first concern is typically safety. With a basketball hoop, you want one that’s made of durable materials and can be stabilized. Look for strong materials and the ability to add sand or water to the base. If you want your kid to be interested in basketball, make it fun. They won’t enjoy a toy they can’t play with, so picking the right height matters. Colorful products make an impact and as they age, they will want something that gets challenging. 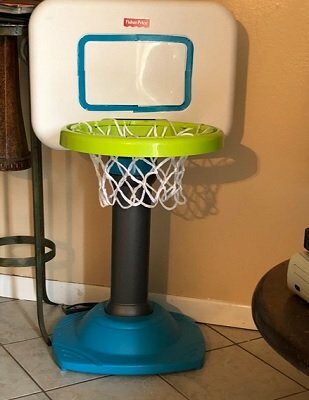 Find a toddler basketball hoop that will keep your kids engaged. 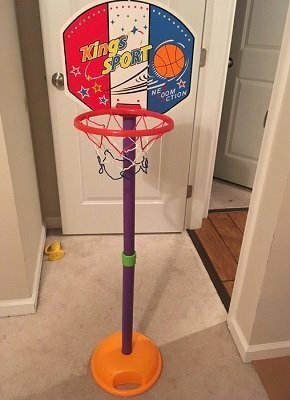 For an adjustable hoop, Fisher-Price has this option that includes a rim attachment to help little kids get the ball in the net. It’s removable so you can take it off when they no longer need it, but that also means some little kids may take it off themselves. Whether or not this is annoying is up to you! You can fill the base with water or sand so it’s more stable, which is a must if you’re going to play with it at a taller height. Sometimes it has trouble staying at the taller heights when adjusted and falls back down to the basic height easily. This is a great option with the fun colors, a large rim, and a sturdy backboard. It can be used inside or outside. If kids pull on the rim, it pops down or even falls off, no dunking! 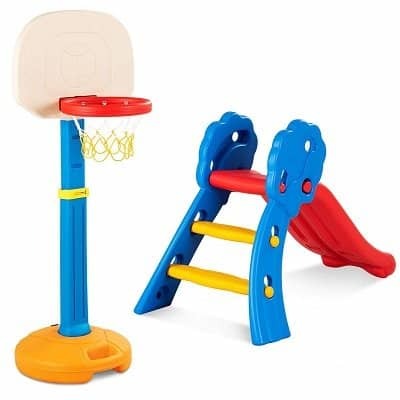 One of the sturdiest options for indoor or outdoor use is this Little Tikes toddler basketball hoop. This is what we’ve had in our backyard and it’s still holding up well after four years (including three cold, snowy winters). We’ve filled the base with both water and sand and found that sand works the best. It comes with basketballs, all of which we’ve lost, but the hoop is wide enough that a variety of other balls also work, including soccer balls. It’s easy to adjust the height, although it doesn’t go very tall. However, it’s a great short size to start with. Adjusting from a height low enough to toddlers to something that would be appropriate for an older child might not be a very stable design. Step2’s adjustable hoop, which competes against the Little Tikes in similarities, has a different adjusting system, which they say means kids can adjust it themselves. Drink holders in the base are an interesting addition, which probably wouldn’t be used much and instead mean you have two circles in the base that will collect water, dirt, dust, and other debris. Like most Step2 products, it’s made of durable material. 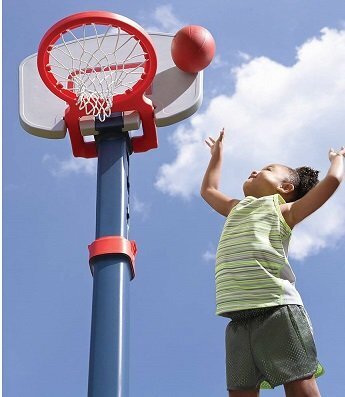 If you’d like your child to shoot hoops from up above, here’s an option! 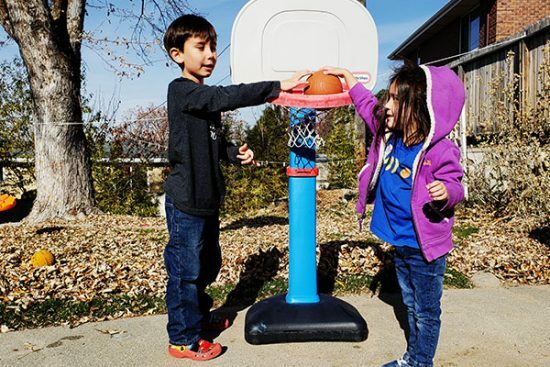 This hoop is built for little kids, but provides more options than simply shooting hoops. Kids can climb up and slide down, crawl through the bottom, or kick the ball through it like a soccer goal. The basketball hoop is small so it’s a good starter option. It’s a safe and easy challenge for little kids to play on this. 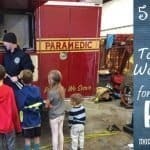 You may be interested in buying a first hoop and slide at the same time as your child learns the mobility skills to play with both about the same time. This can be a good option to combine your purchase. The slide folds for storage, which is a nice feature. Both are great, bright colors. You’ll need to buy basketballs separately. For ages 1.5-8 years. If you’re more interested in buying a slide on its own, check out our reviews for helpful tips, pros and cons: Best Indoor Slides for Toddlers and Preschoolers 2018. It’s a ball pit, too! 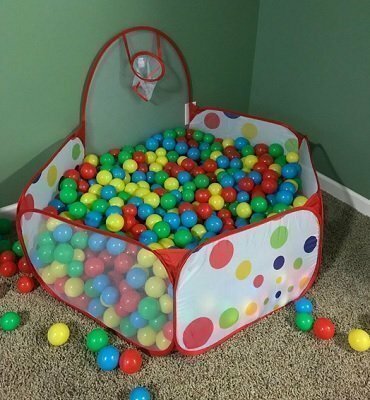 This ball pit/basketball hoop is a fun option. It’s bigger than expected so you’ll want to buy lots of balls to fill it up (It doesn’t come with any balls). This can be a fun, indoor toy for younger kids where they’ll be engaged with all of the balls to play in. 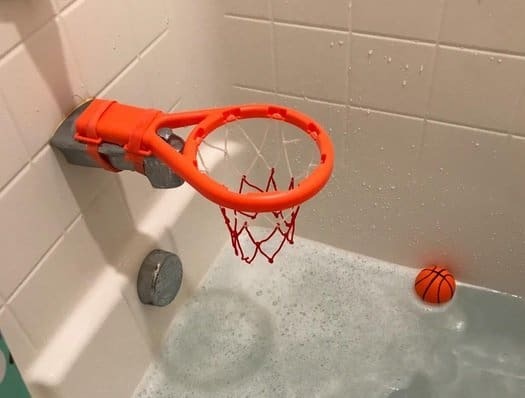 This may get more play time than simply a basketball hoop because kids will want to play in it even when they’re not interested in trying to get the balls in the hoop. If you feel like your kid won’t be initially interested in shooting hoops, try this out, and see how long it takes before they develop that interest! If you’re looking for an affordable option to get your kid interested in basketball without having to invest too much, this could be it! The product comes with three balls for plenty of play. Consider this as a good starting basketball hoop at a reasonable price. It is a small hoop, but you can fill the base with water for stability. Another hoop combination option, this set includes electronics for added fun and engagement. Of course, that means you’ll need batteries, too! There are some fun features on this one that will be very engaging for little kids including shape buttons, bright colors, sounds and the light-up score display. The lever to reset the score is large enough for kids to do it themselves. 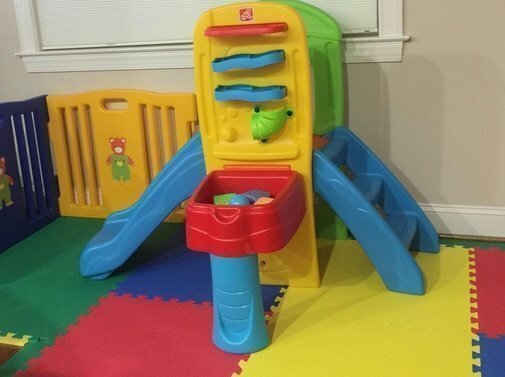 While it’s good quality and stable so it won’t fall over, it’s also small so best for the younger toddlers. This hoop is a great design, snugly fitting over a bathtub faucet with straps that tighten it. You can find other places to put it as well, such as in the car. The balls are made of foam. Sure, they don’t grow mold inside of them, but they do fill up with water easily and little kids may bite pieces out of them. For a sturdier option that works great for older toddlers to young kids, there’s the Best Choice Products Hoop. It’s on wheels, making it easier to move around after you’ve filled the base with water or sand. The shortest setting puts the rim about five feet off of the ground and it adjust up to about six feet. 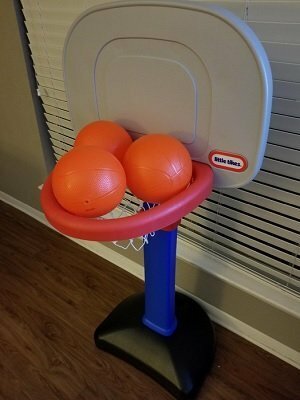 The seller describes the hoop as adjusting up to 8 feet, but that’s the height of the backboard, not the rim; it’s simply something to be aware of. Filling with sand is easier with a funnel and dry sand (play sand is often a bit wet and would take longer to fill up). Filling with water may freeze if you have cold winters so be aware of expansion in the base! 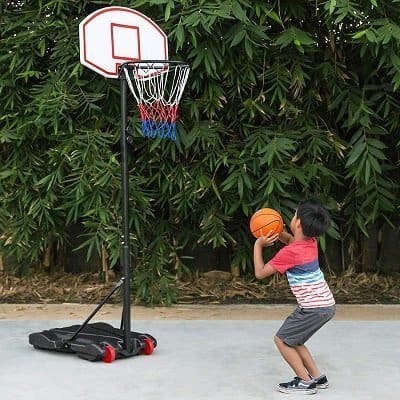 Now that we’ve reviewed ten of the best toddler basketball hoop options out there, you should be able to find the one that works for your budget and preference. There are some really fun combination options that I would have considered purchasing when my kids were little if I’d known about them then! But, our Little Tikes hoop has stood the test of time and we highly recommend it. It’s a classic and still going strong! Just remember that a great basketball hoop is the one that will be fun for you and your kids. Have fun playing together!